Secretary of War Edwin Stanton’s Office - Stanton [Kevin Kline] declines judge’s writ from lawyer Frederick Aiken [James McAvoy]. Photo by Claudette Barius ©2011 Roadside Attractions. All rights reserved. Not for sale or duplication. Secretary of War Edwin Stanton’s Office - During the Civil War, President Lincoln often slept on the sofa while waiting for dispatches from the front. ©2011 Roadside Attractions. All rights reserved. Not for sale or duplication. 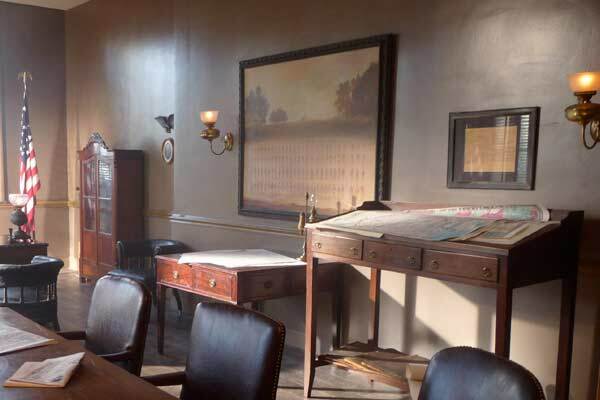 Secretary of War’s Office - Map tables were used to plan and track the battles of the recent Civil War. 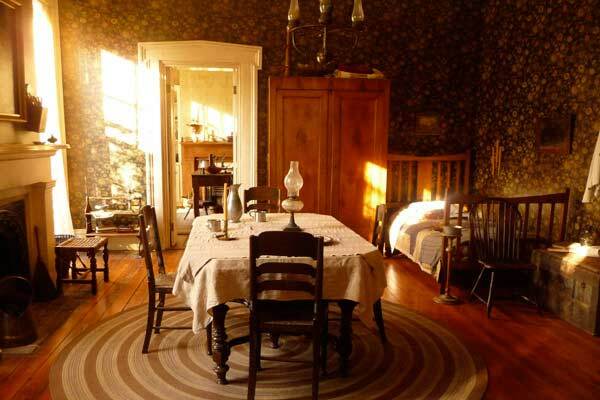 Surratt House Dining Room - A bed was added to the dining room when Mary Surratt had to take in boarders. 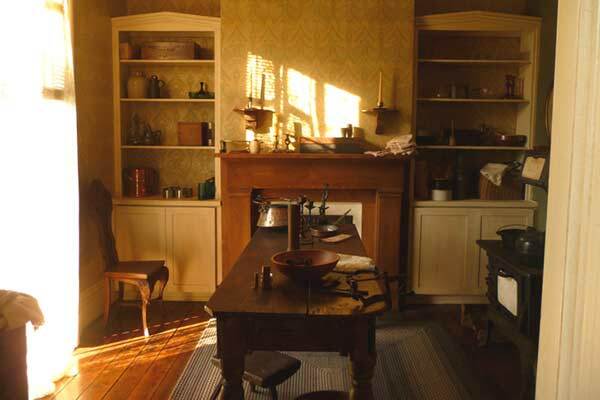 Surratt House Kitchen - Goods were limited during and after the Civil War. Courtroom - The military tribunal of the accused conspirators. Senator Reverdy Johnson’s Office Entry - Renowned constitutional attorney Senator Riverdy Johnson is young lawyer Frederick Aiken’s mentor. 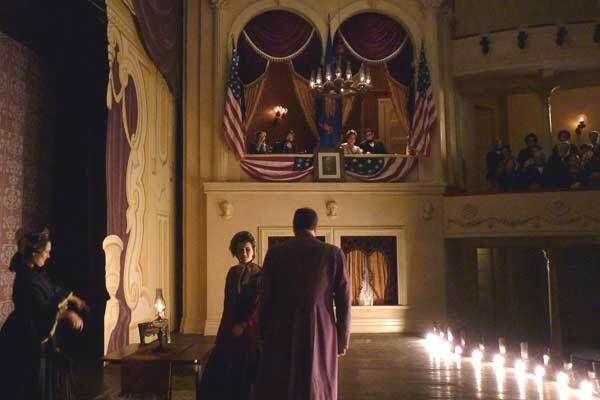 Ford Theatre - The President and the First Lady in their box moments before the assassination. Prison Vendors - Outside the garrison walls, vendors sell memorabilia and goods. Memorabilia -Commemorating the recently assassinated president. 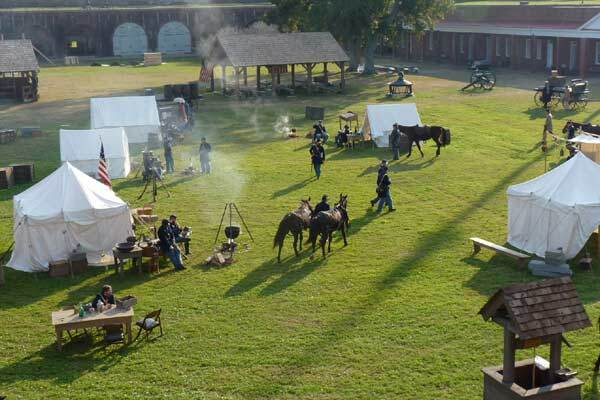 Prison & Garrison - A full encampment guards the prison where the accused conspirators are held. The Conspirator explores the national reaction to Lincoln’s assassination in the aftermath of what was the most shocking murder in US history. Seven men and one woman are arrested and charged with conspiring to kill the President, Vice President, and Secretary of State. The woman, Mary Surratt [Robin Wright], owns a boarding house where John Wilkes Booth [Toby Kebbell] and others met and planned the simultaneous attacks. Frederick Aiken [James McAvoy], a 28-year-old Union war-hero, reluctantly agrees to defend Surratt before a military tribunal, convened and manipulated by Secretary of War Edwin Stanton [Kevin Kline]. As the nation turns against her, Surratt is forced to rely on Aiken to uncover the truth and save her life. 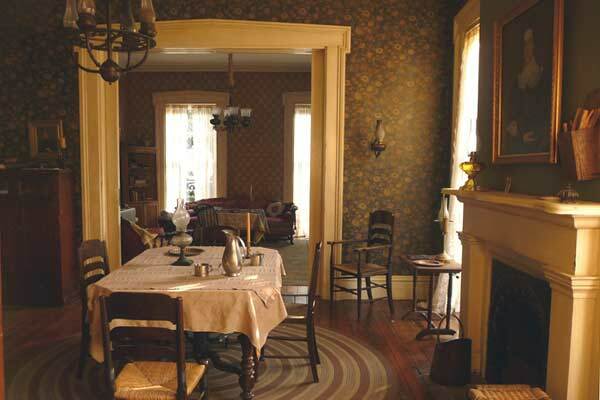 Director Robert Redford brought Production Designer Kalina Ivanov and Set Decorator Melissa Levander SDSA to Savannah, Georgia to help convey the nation’s capital at the end of the Civil War and during a moment of hobbled civil liberties. Levander responds to comments by Redford, Ivanov and the film’s producers. 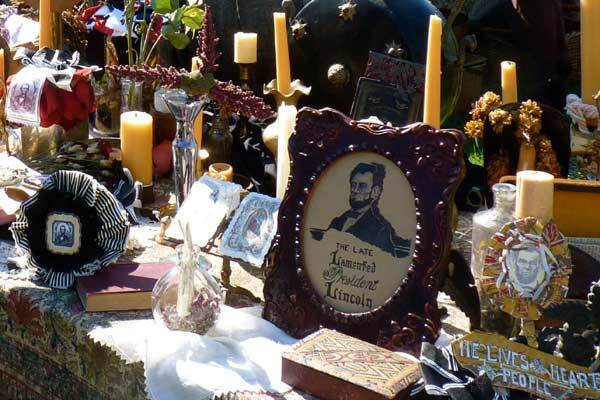 SET DECOR: How much street dressing did you provide? Set Decorator Melissa Levander SDSA: I was responsible for the lighting, benches, barrels, and lots of bunting. In our research, we found that when Lincoln was killed everyone began to put mourning black bunting over the red, white and blue that had been hung in celebration of the end of the war. The 10th Street crowd scene and the street scenes in the aftermath of the assassination took a lot of preparation. We had to hang an extensive amount of bunting and pennants, which was difficult because we were on a real street. We also had to check every window—if the window treatments were not period enough looking, we had to go in and change them. This meant the locations department had to knock on the door and get permission from most people on the block, and then we worked out the proper draperies and set dressing for each street-facing window. 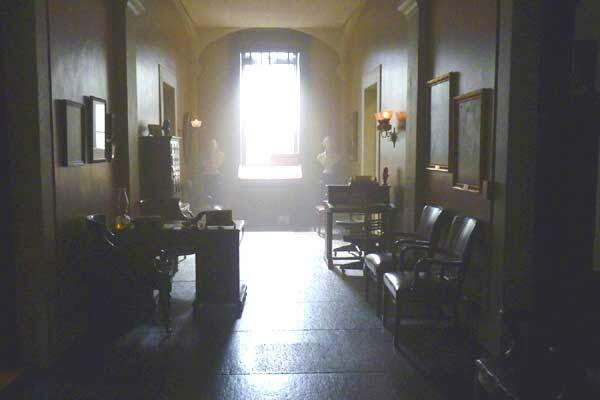 SET DECOR: How did you approach the interiors when shooting in actual buildings of the period? Levander: We focused on color, texture and a period tone. We shot in some amazing historical locations that had great production value, but we had to make sure they worked with the palette we had established. We created boards with fabric, wallpaper, etc. for every set so we could control this. If the location had red drapes and our boards called for gold, we would change them. We mixed Empire furniture with rustic pieces—so many different styles, but a lot of the museum homes also had amazing elements that we could use. SET DECOR: How did you work out the set decoration aspect of the lighting? Levander: This was one of the most difficult aspects of this film. We had a very short prep, and every fixture had to be gas or oil. After my first visit to Savannah going through all of the sets and locations with Kalina, I came back to Los Angeles and grabbed every fixture I thought could work for every set we had. Some were originally set up to be gas, but most were not. If the look was right I took it. When the pieces arrived in Savannah, my crew took them directly to the SPFX dept. Thankfully, Special Effects Coordinator David Beavis and our amazing SPFX team were able to make them work. For some of the very specific lamps, we ordered from a company that specializes in gas lamps. SET DECOR: You mentioned the short prep, particularly for a film that requires historic accuracy. Tell us about the truncated time frame and how you dealt with it. Melissa Levander: I only had 7 weeks of prep! After my first visit to Savannah and the other many locations, I realized I did not have the time or the budget to shop everything locally. I decided it would be best to fly back to LA, load some trucks at a prophouse and have them sent back. I knew I could do it from Warner Bros. Property because they always have a large inventory of antiques. We loaded 2½ semi-trucks full of furniture, draperies, lighting, etc. When everything arrived in Savannah, Lead Person Patrick Fhurman did an amazing job of setting up a beautiful gold room where I was able to “shop” for all of the sets as needed. This saved a lot of time, but we still had to do lots of sourcing locally. My buyer, Summer Eubanks, was a savior—she hit every antique store, and also went to Atlanta to shop the flea market. SET DECOR: Please tell us about the experience of working with/from these actual early photographs. Levander: The photographs were a great resource. We took a lot of ideas from them, but still made the look our own. We realized that in most of the photographs of the interiors of homes, the furniture is pushed aside, leaving the center of the room bare. The seating areas are dressed around the perimeter of the room probably because the dresses were so big back then. This would not have worked for our sets. 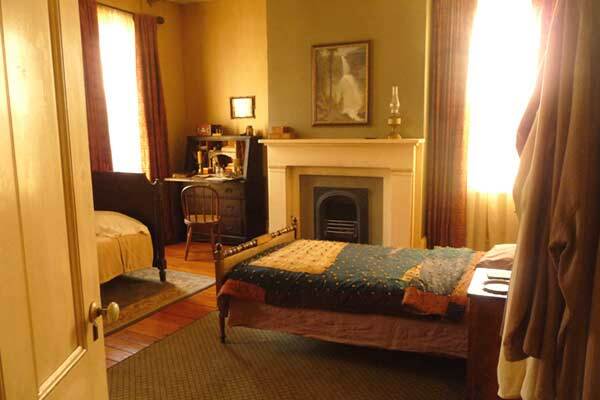 SET DECOR: Tell us about the personal story aspect of the boarding house set. 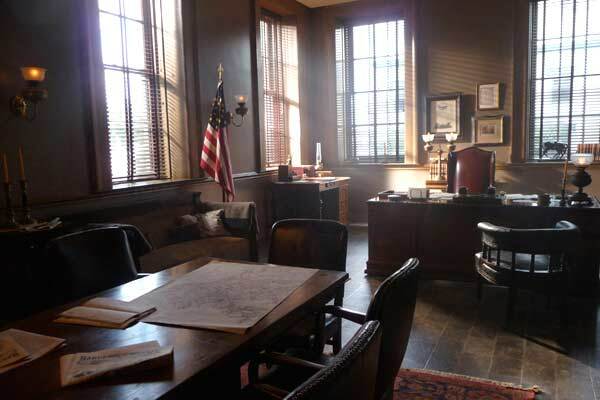 What did the set decoration reveal about the characters? Levander: Mary Surratt was a woman that came from some money, but lost her husband and was trying to make ends meet with the boarding house. We felt she should have remnants of a few nice things mixed in with utilitarian things. Robert Redford asked that I do not overdo it. He wanted to make sure we could see that Mary was struggling to make ends meet. I layered worn table cloths over a nice wood table. We added a bed to the dining room, worn blankets over the sofa. Levander: Just a few elements, but each was important: mattress, pillow, straw, lantern and a bucket. We found some futons that were the right size and had a wonderful seamstress sew multiple slipcovers out of an old ticking fabric. We did the same with casings for small airplane-sized pillows. Consistent throughout all of the research was the fact that straw was used on the floor in the prison cells. Levander: This took a lot of set dressing to fill the huge grounds. We purchased authentic canvas tents of the period and then made sure they landed in the correct spot when they were erected. We knew they would not be easy to move around! Then we filled them and their surroundings. My crew dumped truck after truck full of set dressing to give this area life. There were good Civil War research books for this that we studied extensively. I particularly remember a photo of Lincoln in a tent. There was an American flag folded and draped over the wooden table where he sat – simple and profound. Levander: Thank God for my crew and our interns! 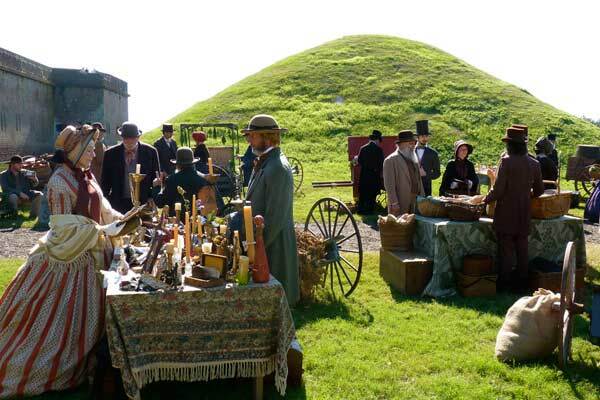 It took so much time to create the Lincoln memorabilia sold at one of the tables. Every piece took thought and creativity. Levander: In one of the research books we read the following quote from Stanton's biographer Frank A. Flower: "The furniture of Stanton's office was of the simplest kind. The only luxury was an old haircloth lounge, from which the covering was half-worn. On this, during great battles or important military maneuvers, he slept when he dared not be away from the telegraph instrument day or night. Here, too, during many an anxious night, Lincoln stretched himself while reading dispatches and consulting the Secretary." Referencing this, I found an old sofa that we aged in the right places and added appropriate pillows. 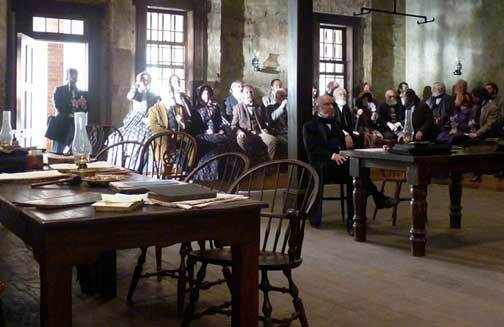 Redford used it in the scene where Surratt’s lawyer Frederick Aiken comes barging in. Stanton jumps up off of his sofa as if he had been asleep there. Levander: Kalina did such a great job in designing this set for very specific camera angles that gave us the sense of a large crowd. The whole stage and one side of the balconies were built, and then there was a floating piece that they could shoot from towards the stage to feel like the full audience. Warner Bros. Drapery Department was able to re-create the draperies for me from a research photo I had given them. We did not choose to use the same color as the originals, but we used the same design. SET DECOR: Please tell us about your collaboration with Production Designer Kalina Ivanov...and with Director Robert Redford. Levander: My collaboration with Kalina is always a great experience. We have done three films together—LITTLE MISS SUNSHINE, MADE OF HONOR and THE CONSPIRATOR. Her ability to convey her designs is amazing. We will talk about scenes as she sketches the sets in front of me. Wow, can she draw! I love that. Direction is imperative, but at the same time she gives me the freedom to decorate and respects my opinion throughout the whole process. Working together on a period film, with the opportunity to reveal a part of actual history, added another dimension. I am proud to have been part of a Robert Redford movie. He’s an amazing man.